That was amazing. I'm excited for 2 o'clock when we get more details. Back to you. Literally none of them even noticed. I bought one from shirt.woot.com at least 5 years ago. Might be available elsewhere now, but that was the original. Because of the way light travels, it hasn't happened yet. But it will happen in about 4 days. It depends on a lot of factors. I threw for 6 years before college with no issues. Then I switched to the 16 pounder and started having wrist issues towards the end of my first season, so I started taping. Now, many many years later, I can no longer throw the 12 without some wrist pain. John Godina made a good point that the wrist is not something that can get stronger. It is what it is, and if you are having issues with your wrist, you should take care of it immediately. If you are experiencing wrist pain, then I suggest using a wrist wrap or taping your wrist. If you are throwing incorrectly (you can also upload a video for us to look at if you don't have someone to help you determine this), then you should address that as well, but don't sacrifice your wrist in the process. First off - this looks great. I was so glad to open a video in here and not be overwhelmed with "where do I start". Because, well, we need to start with the start. It's all in that first turn. I paused the video at your 9 o'clock sit, and this will highlight the majority of what I'm talking about. Now, it's important to note that the shoulders are not level because you didn't get left enough. Had you pushed that shoulder over more, you would have leveled off more. You can also see your eyes are looking upwards a bit - for me, this implies that this is something you are used to doing. If I were your coach, I would probably narrow your stance in the start just by 3 or 4 inches, based on your height. You are just making it harder on yourself to get as far left as you need to. Now I will say that you eventually get your armpit over the knee, but it's too late! As far as the unseat goes, looks like you have the weight on the pinky toe side of your foot. Try keeping the weight on the big toe part of your foot until this point. That will cause a bigger sweep, and will cause the discus to be further back when you are ready to drive in. Having the implement further back, as you probably understand, means we can accelerate it through a longer path. 75-90% of my coaching for discus is on that first turn. If there is anything wrong there, I won't even discuss anything else that went wrong in the throw. You need to focus on the first fault, as anything after that is hard to tell if it's caused by that first fault, or if it's actually a separate thing that needs to be addressed. This is extremely solid. It is not easy to get to the point you are at. You've got your hand over your head when that right foot plants, that right foot is working (maybe not as smooth as I'd like, but that other stuff might fix that), and it's all very smooth. Looks great, but as always with the throws - there is some opportunity for improvement. Gonna need video to tell. My guess is that you aren't keeping the jav back long enough and creating the stretch reflex. Is your armpit pointing to the sky when you are about to push the jav through the point? Your standard power lifts (such as bench press and squat) are done with heavy weight, and so the bar moves slowly. When in a speed phase, the weights should be a lot lighter with a focus on fast bar speed. I wouldn't recommend South Africans as the other poster suggested. They can teach bad habits and change your focus from rotational speed (what we want) to linear speed (the discus will go FAR, but it's something that isn't reproducible from a full throw). There is a way to do South Africans so that it's working on rotational speed, but very few people do it correctly. Technique changes often result in a loss of distance. Most people think that one tiny change can result in great additional distance, but this is rarely the case. Throwing is a grind. You need to keep grinding. You moved from a familiar movement to an unfamiliar movement. It usually takes your body a while to adjust to form adjustments. When your form is more ideal AND your body is more comfortable with that form, this is where the distance will happen. The back of the ring is where I spend probably at least 75% of my time with their throwers. When they have a bad throw, it's generally caused by something going wrong in that first turn. So I'll say this is the right spot to focus on. Make sure you're hitting and holding a good 9 o'clock sit (left armpit on top of the left knee which in turn is on top of the left toes), keeping the left arm with the left knee, and getting a good sweep with that right foot (imagine getting it around a 5 gallon bucket). The 5 gallon bucket drill is one of my favorites. Also, it depends on what phase you are in your lifts. If you are in a strength or volume phase, then it's definitely not a concern. 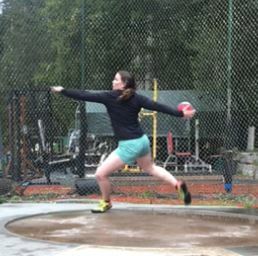 My throwers don't throw very far when my goal is adding strength. If you are in a speed phase, then yes, I'd be concerned, as my throwers usually get a bump in distance when we move to a speed phase. During a strength phase, your bench/squat would be in the 85-95% range, and olympic lifts would be in the 80% range. We're trying to add strength, so the movements are all SLOW. During a speed phase, you'd probably be in 50-70% for bench/squat focusing more on bar speed, and olympic lifts would be in the 90-95% range. But how many Schrute bucks would that be? Antivaxxers, do you get it yet? It's not genocide. We just went over this. It was fine for the job I was trying to do. Thanks! Hey man, you don't actually know anything about what I'm doing, so I'll go ahead and describe it. I have an RSS feed set up to add rows into a google sheet via IFTTT. I then manipulate and filter that data based on a bunch of criteria, and call the webpage from the RSS PubLink to get the tracklist for the album. The tracklist is what I'm splitting (artist name is column A, tracklist is column B). I'm then going to set IFTTT to watch a different spreadsheet, which will be the parsed data, and IMDB will add the artist/track directly to a spotify playlist. So in theory, I won't even need to open the sheet in order for it to do what I want. I really hate coding in python and it would take me 50 times as long. This way I don't need to research using APIs (which I also hate). But I'm a goddamn pro at google docs, so this is what I'm going with. So how about you stop being a pompous know-it-all. Telling people they are using the wrong tool when you don't know the first think about what they are building is not productive. Hm. Yup. Confirmed to be hacky. I'll play around with this. Pretty clever solution. I don't know. I personally think this remake of the classic Harland Williams film went completely off the rails. If you don't have any Marmite, don't worry! You can improve this recipe by simply replacing it with literally anything.